As with many large and complex taxa in which the earliest forms are poorly known (if known at all), the arthropods present particular difficulties as far as phylogeny goes. Molecular evidence remains ambiguous, due perhaps to the fact that many clades diverged rapidly within a very short space of time (the Cambrian Explosion). Many fossil forms are known, but it is always difficult to make assertions regarding what little can be gleaned from the gross morphology preserved. Arthropod polyphyly was popularized by Sidnie Manton. Although a popular view for a while, and still found in many zoology textbooks even today, as well as widely on the Web, it's basic premise - that of three distinct phyla (see above cladogram), is no longer considered tenable by most researchers in the field of high-level arthropod systematics. The consensus is now that arthropods are monophyletic, but the exact order of relationships is in dispute (ref). it seems like every possible alternative has been offered (left - from Giribet and Ribera 2000). The above morphology-based hypothesis still has supporters today, and although the status of the Mandibulata is secure, the Atelocerata as we shall see is less so. The Uniramia are one of the three main phyla proposed by S. M. Manton as part of a paradigm of Arthropod polyphyly. The name Uniramia means "single branch"; as opposed to other arthropod types, which are schizoramous (having branched limbs), the limbs are unbranched, hence the name of the group. They are also identified by their single pair of preoral antennae, possibly homologous with the antennae of trilobites. The body divided into a distinct cephalon (head) and metameric (segmented) trunk. There are three pairs of postoral appendages on head; chewing mouthparts (mandibles) on the second postantennal segment, and compound eyes. They seemed to have evolved a hard exoskeleton later than other groups, but were quick to colonize the land (during the Silurian period). Breathing is by special gas exchange organs along the side of the body called tracheae and malpighian tubules. There are three taxa conventionally included: the Onychophora (velvet worms, which do not posses an exoskeleton, and were previously considered a distinct phylum), and the superclasses Myriapoda and Hexapoda. These would seem to represent an evolutionary sequence, from many-legged soft-bodied forms through many-legged hard-bodied types to few legged forms with fused segments (insects). The poorly known Cambropodus may also be an early uniramian, but this is not certain. Recently however the status of the Uniramia as a valid taxon has been increasingly questioned and evidence presented suggesting the Crustacea are the stock from which the Hexapoda arose (i.e. Hexapods and Crustacea form a monophyletic group apart from the Myriapoda) - the Pancrustacea hypothesis, although this is still controversial. Equally if not more damaging is fossil research that shows that transitional lobopod-arthropod-like forms reveal a continuity between lobopodians proper and Euarthropods, thus supporting the monophyly of the Arthropoda and invalidating the Uniramia. A limited version of the Uniramia, the Atelocerata, includes only euarthropodic Uniramia, but this would also be invalidated if the Pancrustacea theory turns out to be correct. The above cladogram shows the Schizoramia as sister group to the Myriapoda + Hexapoda. However, we follow the "Pancrustacea" school of thought, which unites hexapods and crustaceans. To provide some stability to the region, it is useful to have a clade which unites all four living branches of the arthropods. This is it. Atelocerata - also called Tracheata and Uniramia, although Atelocerata is more correct (ref) - is a daughter clade of the Mandibulata of Snodgrass 1938 and others that unites hexapods (insects and their kin) and myriapods. The taxon went out of favour when S. M. Manton erected the Uniramia, but with the more recent rejection of Arthropod polyphyly it has become more popular again. The poorly known middle Cambrian Cambropodus gracilis has been suggested as an ancestral ateloceratan (Robison 1990) , although this assignment has been criticised. The Paleozoic Euthycarcinoidea would also seem to be safely uniramian but their exact relationships are not clear. In the 1990s, many studies used molecular analysis to unite crustaceans with atelocerates (hexapods and myriapods) in the old established taxon Mandibulata, there are also many that align crustaceans with chelicerates and trilobites (as the "Schizoramia"). Supporters of Mandibulata can't agree whether Atelocerata is monophyletic and sister to Crustacea (the majority position), or whether crustaceans are sister to hexapods (the Pancrustacea hypothesis). These conflicting results are influenced by the fundamentally different classes of evidence on which they are based, as well as reliance largely or wholly on recent forms to reconstruct ancient events. The relative infancy of molecular systematics during the 1990s and turn of the 21st century meant that the data may not be adequate to the task, and produce misleading results. An rRNA study by Giribet and Ribera 2000 was inconclusive, as the high level of sequence heterogeny made placement of some taxa difficult and showed the importance of combining ribosomal gene data with other sources of information. "The homology of characters brought forward in favour of a close relationship between myriapods and insects (absence of second antennae, formation of malpighian tubules, postantennal organs and tracheae) cannot well be established. These characters may be due to convergence. This is especially true for the tracheae. In contrast, the...characters combining insects and crustaceans, malacostracans in particular, ( axonogensis in early differentiating neurons, formation of neuroblasts, fine structure of ommatidia, expression patterns of the engrailed gene) seem to be much better substantiated." Wolfgang Dohle, "Myriapod-insect relationships as opposed to an insect-crustacean sister group relationship"
"Despite the diversity of their limbs and lifestyles, the nervous systems of insects and crustaceans share many common features both in development and in function....Examples include the basic ganglionic architecture and the strikingly similar pattern of GABAergic inhibitory enervation of leg muscles in Crustacea and insects. These and other examples...argue against the idea that these two groups of arthropods evolved independently from separate non-arthropod ancestors....Myriapods are often regarded as being more closely related to the insects than are the crustaceans. However, we find that myriapods show substantial differences, for example in the pattern of early axon growth, to the common pattern of early neural development seen in the Crustacea/insecta." Suggestive as these facts may be, they are not totally persuasive, for the Uniramia hypothesis is also built on factors of similarity in embryology and physiology. 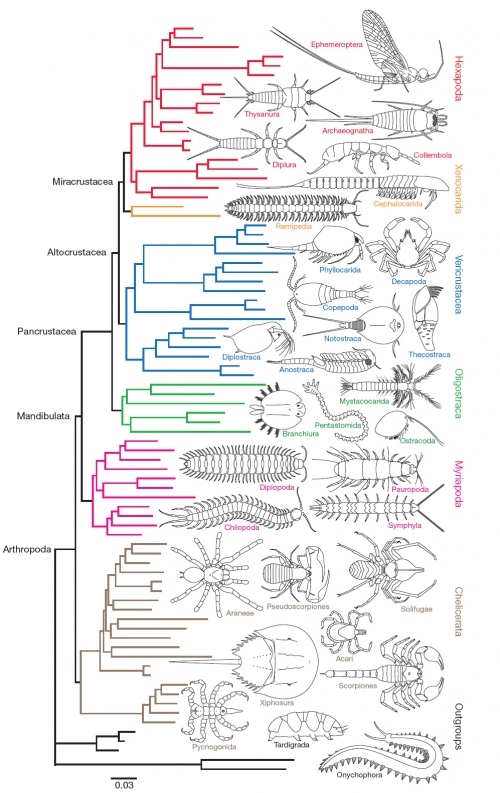 Clearly, there has been a great deal of parallelism and convergence in the evolution of the arthropods. "Most recent studies suggest a close link between insects and crustaceans, but the relationships of myriapods (centipedes and millipedes) and chelicerates (spiders and allies) with this 'Pancrustacea' group have been contentious. Hwang et al. present molecular evidence for a close link between myriapods and chelicerates. In contrast, Giribet et al. mix molecules and morphology in a bold 'total evidence' approach that produces a more traditional arrangement, with myriapods closer to insects and crustaceans, and chelicerates lying further away." At first, insects and cruastacea were considered sister taxa, as shown in the following cladograms. More recently, a definitive molecular study by Regier et al 2010 (right) goes much further, by nesting insects (hexapoda) deep within Crustacea. The main problem with the Pancrustacea theory is the lack of transitional forms, especially in the fossil record, where one would expect to find them most. Not surprisingly, Conway Morris and Hou & Bergström, who adopt a wholly paleontological approach, retain the old taxon Uniramia. An ironic twist, if this hypothesis does turn out to be true, will be that Crustacea will then become a paraphyletic taxon, and hence invalid under the cladistic system, perhaps to be replaced by a confusing array of smaller clades. Or insects will have to be called "crustacea", just as many vertebrate paleontology enthusiasts now refer to birds as dinosaurs, thus confusing the fact that birds, while evolving from dinosaurs, really have become a distinct form of animal. The same can be said of insects and crustaceans. Affinities among Cambrian arthropods, deduced by cladistic methods on the assumption of monophyly, are unreliable, and some are certainly erroneous. For example, Sarotrocercus, said at different times to be close to Limulus and a eurypterid, then to Yohoia and Sanctacaris, and most recently to Molaria and Leonchoilia, bears little resemblance to any of these very different animals and is in fact one of the most primitive arthropods yet discovered. For these various reasons it would seem advisable to take many of the cladograms and phylogenetic hypotheses dealing especially with earlier and less well-known taxa, with a small Siberian salt mine. The closer one gets to modern taxa, the more reliable findings may be, but even there is an element of uncertainty (as shown by the rival interpretations regarding myriapod, insect, and crustacean relationships, which may remain for some time to come. In contrast, the homology and synapomorphy of characters combining insects and crustaceans, malacostracans in particular, ( axonogensis in early differentiating neurons, formation of neuroblasts, fine structure of ommatidia, expression patterns of the engrailed gene) seem to be much better substantiated. "